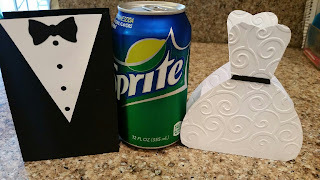 Here is my second video as promised in my last Video here for the Tuxedo part of the favor boxes along with an additional filler box. Happy to say no camera falling over this time. Although, there was a little thunder going on in the beginning of the video. I used the Cuttlebug embossing folder and the Silhouette Cameo to cut. See my last video for more details. I really appreciate your stopping by and leaving your comments. Be sure to follow me as I will be posting more 3D projects and video's soon. Pretty boxes! Thanks for sharing at CC & CC! Lovely gift boxes! Thanks for sharing with us at Word Art Wednesday this week, hope you'll join us next week for our 200th challenge!! Hi Kitt could you please email me @ tillie65@bigpond.com I just cant find your contact you button... Thanks in advace... Cute Favour Boxes ..
Super little boxes! They look great! Thank you for joining Moo Mania & More! Very pretty favor boxes. Love the embossing on the dress. Thanks for joining the Crafting With An Attitude challenge. Definitely a budget-friendly option for brides! What a pretty design, too! Great wedding favour boxes! Love all the embossing on the bride box. Thank you for joining in the Paper Shelter Challenge this time. Hope to see you again soon. very clever & great idea - would be perfect for a little princess party too. Thanks for joining us for our 'Anything Goes' challenge #40.